A bus tour is a great way to see the sights of New York City. It is not only a convenient way to get between them, a bus tour also offers a great vantage point to view this amazing city. Three companies offer bus tours in New York(Big Bus Hop-On Hop-Off, Gray Line Bus NYC, City sights Bus tour New York), and we give you all the details of the tours, routes and prices here. They all offer similar routing and are competitively priced. Big Bus Tours is the most highly rated and justifiable popular. Take note though that they focus on the central areas, but the other two companies offer better options in Brooklyn and the Bronx too if you want to see these areas. Another important consideration is that Bug Bus Tours and CitySights Buses are included with different New York City discount attraction passes. This can represent a great economical way to save on your stay in the city, check out our guide to such discount passes. Big Bus Tours go through 4 routes covering all the major attractions in New York. It is rated the best hop-on hop-off sightseeing bus tour in New York by TripAdvisor, Tours offers live commentary, free mobile app, and restaurant, shopping, and tour discounts. The 2 Day and 3 Day also include a complimentary Hornblower River Cruise and free entry to the Museum of the City of New York with 3 Day ticket. Gray Line buses, which are also known as City Sightseeing buses are red in colour and run in 5 different routes. These 5 routes cover all the major attractions of New York and you can hop on and hop unlimited times with live audio commentary. It also offers complimentary hop on hop off ferry rides, Museum of the City of New York, and "Eat and Play" discount card with the 2 Day and 3 Day ticket. CitySights Buses also allow unlimited hop on hop off - similar to the other sightseeing bus tours of New York. It also has 5 routes with live audio commentary. The complementary offers with 2 Day and 3 day ticket includes hop-on hop-off ferry, a choice of 2 museums, "Eat and Play" discount card, and 2 free car sharing rides. Discover New York City aboard the city sightseeing bus with a 1-day New York Bus Tour ticket. Hop-on the open-top double-decker bus and see sights in 360-degree panoramic views and listen to the audio guide in different languages. The professional tour guide makes sure you never miss a thing while travelling through Downtown Manhattan and its top attractions such as Central Park, Rockefeller Center, Radio City, 9/11 Memorial and Flat Iron, South Street Seaport, Financial districts, Empire State Building, Times Square, the United Nations, Fifth Avenue, Greenwich Village, Little Italy, and many more. Get on a ferry cruise and see New York's skyline from the water's point of view with 4 stops in Manhattan and Brooklyn. Hop-off the ferry and explore on foot and walk through the Brooklyn Bridge Park, Wall Street, Theatre District, Times Square and many more and enjoy skip-the-line access at the One World Observatory where you will get up more than 100 stories in less than a minute. See New York in 360-degrees from the 102nd floor of the One World Observatory, then visit the 9/11 Tribute Centre just close by and listen to the stories and how the city rebuilt after the terror attack from the tour guide. Hop-On, Hop-Off Tour: Buses run from 8:00 am to 6:00 pm. City Sightseeing New York Hop-On, Hop-Off Ferry: Daily 10:00 am to 4:00 pm. 9/11 Tribute Center: From 10am to 6pm & 5pm on Sundays. 9/11 Tribute Center and many more. Yes (11 languages) English, French, Spanish, German, Italian, Portuguese, Mandarin, Russian, Japanese, Korean or Hebrew. Optional tours to Madam Tussauds Museum, Empire State building, Statue of Liberty, and One World Observatory at an additional price. Print the voucher in your mail and exchange it near Stop 1, Times Square 48th Street. Print the voucher in your mail and exchange it at Gray Line Visitor Centre on Times Square. You are required to present the paper printed voucher to the driver who will exchange it into a ticket at the departure point. Where to Buy New York Big Bus Hop-on Hop-off Tour? We are comparing the Best NYC Hop On Hop Off City Sightseeing tour Prices from leading online Tours and Ticket suppliers, try to find you cheap tickets prices on the market. Where to Buy City Sights New York Bus Tours? Where to Buy New York Grey Line Hop-on Hop-off Tour? Where to Buy Bus Tour + World Observatory? City Sights New York Bus Tours is a handy service for tourists to familiarize themselves with the popular Big Apple. This bus service has 4 hop-on hop-off lines and a panoramic Night Tour. This offers you a convenience of organizing the sightseeing the way you are comfortable with. In addition to bus rides, City Sights NYC Bus Tours bestows its users with extras, such as a hop-on hop-off ferry ride, discount cards and more. New York sightseeing by bus. Admiring the city from the river on an optional ferry ride with 2-day tickets. 4 available routes passing by top attractions of the city. A visit to one of two participating museums with a card whose validity is 2 days. Complimentary discounts at Manhattan's restaurants and shops with 2-day passes. Live commentary in English on board every bus. Audio commentary available in major languages of the world. Discovering points of interest and learning facts about them. City Sights Bus Sightseeing Tour is a part of the tourist Explorer Pass. Tours covering Downtown, Uptown, Brooklyn and Bronx areas. You will see the Central Park, Times Square, Statue of Liberty and many other places and landmarks. Sightseeing ferry cruise with stops along the way (with 2-day passes). A visit to the New York Historical Society or the Museum of the City of New York (2-day cards). We are comparing the Best City Sights New York Bus Tours Prices from leading online Tours and Ticket suppliers, try to find you cheap tickets prices on the market. Bus stops: Times Square 48th, Broadway/Theatre District, Madison Square Garden, Empire State Building, Empire State Building-2, Flatiron District, Union Square, Greenwich Village, SoHo, China Town/Little Italy, City Hall/Brooklyn Bridge, Battery Park - to the Statue of Liberty, South Street Seaport, Lower East Side, East Village, United Nations, Waldorf-Astoria Hotel, Rockefeller Center, Central Park, Park Central Hotel and Winter Garden Theatre. Bus stops: Times Square 42th, Times Square 46th, Times Square 56th, Columbus Circle, Lincoln Centre Plaza, Dakota/Strawberry Fields, American Museum of National History, Quality Inn/Newton Hotels, Upper West Side, Cathedral of St. John the Divine, Grant's Tomb, Apollo Theatre/Harlem, Malcolm Shabazz Harlem Market, Museum of the City of New York, Smithsonian National Museum of Design/Jewish Museum, The Guggenheim Museum, The Metropolitan Museum of Art, The Frick Museum, Central Park Zoo, Central Park South, Winter Garden Theatre and Times Square 42th. Bus stops: City Hall/Brooklyn Bridge, Brooklyn Promenade, Atlantic Avenue Middle Eastern Restaurant, Barclays Centre, Brooklyn Museum of Art, Prospect Park Zoo, Brooklyn Public Library, Fort Greene Park and Junior's Restaurant. Bus stops: Grant's Tomb, Malcolm Shabazz Harlem Market and Yankee Stadium. TripAdvisor: This hop-on hop-off sightseeing tour has an average rate of 3 on TripAdvisor by over 1800 reviewers. Albeit the rate isn't very impressive, travelers that used this company's services agree that they enjoyed the experience very much. Most of the complaints relate to questionable performances of the guides. Also, a number of negative reviews underlines long waiting times. But, the traffic in New York tends to be heavy, so little is in the hands of the company in this regard. Viator: Tourists that booked the sightseeing tour via Viator have a good opinion of the service. The average rate by 180 reviewers is 4. Get Your Guide: With an average rate of 4.1 by 79 reviewers, this service is pretty popular with people who booked the tour via Get Your Guide. With thoroughly covered Brooklyn and Bronx districts, City Sights New York Sightseeing Tour is especially convenient for tourists interested in these neighborhoods. Also, this provider offers complimentary extras with each ticket. So, you can reserve a bus tour and other activity that interests you at once. This New York sightseeing tour also comes with the pre-recorded commentary in around a dozen languages. Free amenities, such as a visit to the chosen museum, cruise and discounts at specified eateries and shops are also a big bonus. With the VIP ticket, you also gain fast-track boarding on the bus. Finally, you enjoy the tour of this provider if you have the Explorer Pass. Is the CitySights NYC bus tour Right for Me? The City Sights New York Bus Tours is an ideal option if you like to combine bus tours with other amenities. Those on offer by this bus sightseeing company are a hop-on hop-off ferry ride, discounts at participating restaurants and shops and a visit to the selected museum. If a priority boarding also means to you, the City Sights Bus Sightseeing Tour has a solution for you. Also, you are free to choose a language of the audio narrative you understand best. The Big Bus is a bus sightseeing provider in the city of New York. The service on offer allow you to explore the Big Apple in a manner most convenient for you. With interconnected bus routes, you can travel around the city with high efficiency. More so, strategically deployed stops allow you to take off the bus and resume the ride anytime you wish. In addition, you benefit of complimentary tours and visits to attractions with specific passes. Discovering New York downtown and neighboring areas (Brooklyn and Bronx). 4 bus routes, an optional river cruise and tickets for the Museum of the City. 1-, 2- and 3-day passes. Around 35 stops on all bus lines. Audio commentary in 10 languages, including English, French, Spanish and Japanese. Touring top attractions and places of interest in the Big Apple. You will see the Central Park, Times Square, Madison Square Garden, Rockefeller Centre and the American Museum of National History among other sites. English-speaking guides on board every bus. Panoramic Night Tour by bus. Optional tours to the Statue of Liberty, One World Observatory, Empire State Building and the Madame Tussauds. The Big Bus Sightseeing Tour is part of New York and Big Adventure passes. The Hornblower River Cruise with 2- and 3-day tickets. Free entrance to the Museum of the City of New York with the 3-day ticket. Young children don't pay for a ride. Premium ticket adds a choice between the Panoramic Night Tour or the 1-hour Cruise. Deluxe ticket offers you two additional choices. A choice between the Panoramic Night Tour or the 1-hour Cruise is the 1st one. The 2nd option includes choices between the Empire State Building or the Statue of Liberty tours. Bus stops: Times Square 48th, Times Square 42nd, Empire State Building, Korea Town, Flatiron District, Union Square, Greenwich Village, NOHO, SoHo, China Town/Little Italy, World Trade Center, Battery Park - to Statue of Liberty, Battery Park - Battery Place, High Lane, Madison Square Garden, Theater District Shopping Court and M&M's World Stop. Bus stops: Times Square 48th, Times Square 42nd, Rockefeller Centre, Central Park & Columbus Circle, Lincoln Centre Plaza, Dakota/Strawberry Fields, American Museum of National History, Cathedral of St. John the Divine, Grant's Tomb, Apollo Theatre/Harlem, Museum of the City of New York, The Guggenheim Museum, The Metropolitan Museum of Art, The Frick Museum, Central Park Zoo, Central Park South and M&M's World Stop. Bus stops: Battery Park and One World Observatory. Bus stops: M&M's World Stop. TripAdvisor: The Big Bus Hop on Hop off Sightseeing Tour has an excellent rate of 4 by around 8300 users on TripAdvisor. The percentage of extremely satisfied customers is stunning 54% while very satisfied travelers participate with 23%. The number of disappointed customers is within usual limits, which is several percent. In the following, you can read a few reviews from past users of this bus service. Me, my girlfriend and her parents all took a trip on the BIG BUS NYC last week while visiting. We had tour guide John Harkins who was excellent. Not only was he very knowledgable he was also very funny and entertaining! We all loved every second of it. Keep up the good work Johnny! Viator: Some 875 reviewers on this booking website have beaten TripAdvisor's users in complimenting the provider. They rated the New York Big Bus Tour with the 4.5 rate. Get Your Guide: Some 130 commentators on the Get Your Guide booking portal rated Big Bus Hop-On Hop-Off Tours with the average rate of 4.4. The Big Bus Hop on Hop off Sightseeing Tour is the most favorite New York bus tour on TripAdvisor. Most of its former users are simply blown away with the quality of the service. Besides 4 available routes, it offers complimentary tours, a cruise and tickets for museums for a better in-depth overview of the Big Apple. An additional benefit for the card holders is a choice between specified services with additional tickets. Buses of the New York Big Bus Tour are wheelchair accessible and intervals between departures are short. Besides audio commentaries, English-speaking travelers benefit of an entertaining English-speaking guide on board the bus. In addition, services of this provider are a part of New York Pass and Big Adventure Pass. Is Big Bus Tour Right for Me? Considering the number of satisfied users, you can hardly go wrong with the Big Bus Hop-On Hop-Off Tours. The bus tour is ideal for people who stay in the Big Apple shortly or for a prolonged time since it offers passes for 1, 2 and 3 days. With 10 available languages, you are very likely to listen to the audio commentary in a language you are familiar with. Also, you benefit of additional services with upgraded tickets (Premium and Deluxe), such as the cruise, a tour and a visit to a museum. Gray Line is the bus sightseeing provider that covers downtown, Brooklyn and Bronx areas of New York. The service disposes of stops next to major attractions of the Big Apple, so you can alight from the vehicle at any point. Consequently, you are free to choose where and when to resume your ride. Besides, Gray Line Hop-On Hop-Off Tour offers additional amenities, such as a river cruise, museum ticket and a discount card. New York City sightseeing by bus. Optional river cruise and free entry to the Museum of the City of New York. Accompanying audio commentary in all major languages in the world. A bonus discount card for restaurants, shops, attractions and entertainment. 5 available bus tours including the Night Tour. Hopping on and off the bus at your leisure at any of a few dozen stops. You will see top tourist attractions and famous sites throughout New York, such as the Central Park, Madison Square Garden and Times Square. You will see the Guggenheim Museum, Statue of Liberty, Rockefeller Centre and the Empire State Building among other sites. Great coverage of the Brooklyn and Bronx neighborhoods. Live guide on every bus in English. A choice between several passes for a better personalized experience. Free 2.5-hour panoramic Night Tour. Hop-on hop-off ferry ride with 2- and 3-day passes. Free admission to the New York City Museum for holders of 2- and 3-day tickets. Children under 3 don't pay. We are comparing the Best Grey Line New York Hop-on Hop-off Tour Prices from leading online Tours and Ticket suppliers, try to find you cheap tickets prices on the market. Bus stops: Times Square 48th, Broadway/Theatre District, Madison Square Garden, Empire State Building, Flatiron District, Union Square, Robin Museum of Art, Greenwich Village, SoHo, China Town/Little Italy, City Hall/Brooklyn Bridge, World Trade Center, Battery Park - to the Statue of Liberty, South Street Seaport, Lower East Side, East Village, United Nations, Waldorf-Astoria Hotel, Rockefeller Center, Central Park, Park Central Hotel and Winter Garden Theatre. Bus stops: Times Square 48th, Columbus Circle, Lincoln Centre Plaza, Dakota/Strawberry Fields, American Museum of National History, Upper West Side, American Youth Hostel, Cathedral of St. John the Divine, Grant's Tomb, Apollo Theatre/Harlem, Malcolm Shabazz Harlem Market, Smithsonian National Museum of Design/Jewish Museum, The Guggenheim Museum, The Metropolitan Museum of Art, The Frick Museum, Central Park Zoo, Central Park South and Port Authority Bus Terminal. Bus stops: Brooklyn Promenade, Atlantic Avenue Middle Eastern Restaurant, Barclays Centre, Brooklyn Museum of Art, Prospect Park Zoo, Brooklyn Public Library, Fort Greene Park and Junior's Restaurant. TripAdvisor: Users of the New York Gray Line Bus Sightseeing have rated this service with an average rate of 3.5 on TripAdvisor (around 5250 reviewers). The percentage of extremely satisfied to extremely displeased travelers is 29% to 20% respectively. However, we have to point out that most complaints relate to long waiting times. Which, with the Big Apple's traffic jams, may not be the company's sole responsibility. The percentage of satisfied users is 24%. First, their employees wear bright red jackets so they're easy to find at the bus tour stops. You can hop on an off all day, see all kinds of museums and buildings and walk in between tour stops to grab food and drink. Then there is Leon, the best looking tour guide who channels Dustin Hoffman in the film Rain Man with his exhaustive knowledge of how many steps there are in the Empire State Building. So in addition to learning the reason and street sighs being four different colors and lots of facts about bridges, buildings and things about NYC, you are sitting with a clear view of all of it. Thank you to Leon (best looking tour guide in NYC) for informing and entertaining. Viator: Travelers that booked Gray Line Tours NYC via Viator have rated the overall experience with the 4 rate (around 100 reviewers). We could say that the biggest strength of the Gray Line Bus Tour is the choice between separate tickets for each of New York's attractive neighborhoods. If you wish to tour the downtown, Brooklyn or any other area solely, you don't need to go in circles and pay a full-price ticket. Just opt for the specific ticket and enjoy. Note that 1-day passes come without useful extras. For people that wish to discover as much of New York as possible, New York Gray Line Bus Sightseeing has 2-day and 3-day tickets for all bus routes. In addition, holders of these passes are free to enjoy a hop-on hop-off ferry ride and a visit to a reputable museum. Also, with the Eat and Play discount card, you benefit of discounted dining and shopping in some of Manhattan's restaurants and stores. Unlike other New York bus services, tours of Gray Line aren't included in any of the Big Apple's city passes. Is the Gray Line Hop-On Hop-Off Bus Tour NYC right for me? Gray Line City Sightseeing Tour is ideal for travelers willing to explore a specific area of the city (Brooklyn, Bronx or other). With the panoramic Night Tour included, you would benefit of a prolonged service with this provider. For enjoying attractive discounts at restaurants and stores, a sightseeing cruise and a visit the City Museum, Gray Line is the right choice. Explore New York City on a double-decker open-top bus with panoramic views of the city's skyline and its top attractions. Use a 24-hour pass to enjoy free Wi-Fi onboard the city sightseeing bus and free headphones to listen to the audio commentary in 11 different languages. The bus also includes a live licensed tour guide who gives the history of all the top attractions from Downtown to Uptown Manhattan (Brooklyn to the Bronx). Travel past top attractions such as Central Park, Rockefeller Center, Radio City,9/11 Memorial and Flat Iron, South Street Seaport,Financial districts, Empire State Building,Times Square,the United Nations,Fifth Avenue, Greenwich Village,Little Italy, and many more. Enjoy express admission onto the city sightseeing ferry and see New York's skyline from the water. Get off the ferry and explore on your own places like Brooklyn Bridge Park, Wall Street, Theatre District, Times Square and many more. Go up over 100 stories in less than 60 seconds and get a different view from atop the 102nd floor of the One World Observatory. Also, visit the 911/ Tribute Centre nearby and listen to the stories and how New York rebuilt after the terror attack on the city from the tour guide. Marvel at Manhattan’s landmarks such as the Financial District, Central Park, 9/11 Memorial, Fifth Avenue, Greenwich Village,Little Italy, and more. Enjoy discounts with the Eat and Play Card at restaurants, attractions, retailers and more. There are no complimentary tours included in the New York Bus Tour with One World Observatory. This hop-on-hop-off bus pass includes an Eat and Play Card and other discounts. How much is a 1/2 Day New York Bus Tour with One World Observatory? NOTE: Children from 0-1 years ride the New York Bus Tour with One World Observatoryfor free and must be in the company of adults. Empire State Building, Greenwich Village, SoHo, Little Italy, Chinatown, The World Trade Center site, Battery Park, South Street Seaport, Times Square, Rockefeller Plaza, Radio City, the United Nation, Fifth Avenue, Times Square, the Theatre District, Wall Street and Brooklyn Bridge Park, Pier 78, World Financial Center, One World Observatory, 9/11 Tribute Center and many more. 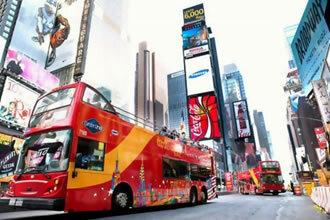 New York Bus Tour with One World Observatoryincludes a lot of exciting activities for tourists. With this pass, tourists can get on the hop-on-hop-off open-top bus and travel along the many stops around New York City from Downtown Brooklyn to Uptown the Bronx. The free headphones onboard enable tourists to get all the insights about the city while listening to the audio guide in 11 languages. Also, available on the bus is a licensed English tour guide who explains all the attractions and landmarks in the city. Tourists can hop-off the bus and get on the city sightseeing ferry, to see another awesome view of New York from the water. Cruise past some attractions along the 4 stops in Manhattan and Brooklyn. End your tour at the One World Observatory, with a 102-floor ascent in less than 60 seconds and see New York is 360-degree from the last floor. Then pay your respect to the fallen heroes at the 9/11 Tribute Centre with a tour guide who shares the stories and how the city rebuilt after the attack. Within 24-hours, tourists will have explored all the places in New York City. Is the New York Bus Tour with One World Observatory right for me? Yes! New York Bus Tour with One World Observatory is right for you! It combines a lot of fun and memorable activities to make your tour worth the while in New York City. The hop-on-hop-off bus pass offers you access on the open-top double-decker bus with free Wi-Fi and headphones to listen to the onboard recorded audio guide in 11 languages. A professional licensed English tour guide is also available on the bus to tell you about the city's landmarks as you travel past attractions such as Central Park, Rockefeller Center, Radio City,9/11 Memorial and Flat Iron, South Street Seaport,Financial districts, Empire State Building,Times Square,the United Nations,Fifth Avenue, Greenwich Village,Little Italy, and more. Marvel at New York’s amazing skyline onboard the city sightseeing cruise on the water and see iconic attractions along the four hop-off stops in Manhattan and Brooklyn. You can get off at any of the stops to get close and personal with attractions like the Times Square, Wall Street, the Theater District, Brooklyn Bridge Park and many more! Your tour pass also includes admissions to the One World Observatory and the 9/11 Tribute Centre. Enjoy 360-degree views from the 102nd floor of the building and visit the nearby 9/11 Tribute Center to learn and show respect to all the fallen heroes with a tour guide to enlighten you more. This is truly an amazing way to see New York in a day without limits.